I just glanced over my Facebook feed and saw this gorgeous image of the Orisha Yemaya, posted by Religion Yaruba. It made me so happy seeing how many lucky Lenormand symbols are in this one painting, surrounding a glorious Yaruban deity with whom my Spirit is personally intwined. 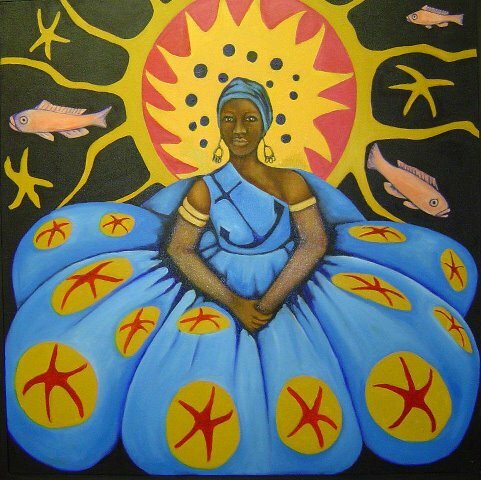 In this image Yemaya is framed by Fish and Star(fish). Behind Her shines a radiant Sun. Adorned with a flowing blue dress of the oceans, a prominent Anchor decorates Yemaya’s torso. Her message couldn’t be more auspicious! Maferfun Yemaya! Thank you, mami!